Mt. Diablo, the Altamont Hills and the Diablo Range are some of the outstanding physiographic features of the Bay Area. Understanding how these features were formed has been the focus of several NCGS field trips. 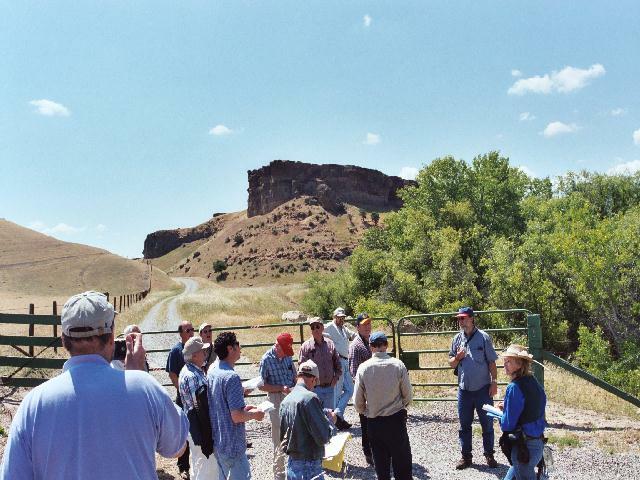 On Saturday, May 10, NCGS members and friends joined Ron Crane on a field trip to investigate the area where all these major features come together. Since his retirement from Chevron, Ron has undertaken a major project to map and understand the geology of central California. The main products of his investigations are a series of geologic quadrangle maps and structural cross sections throughout the region. He has led numerous field trips in the area and has published seven field trip guidebooks through the NCGS. 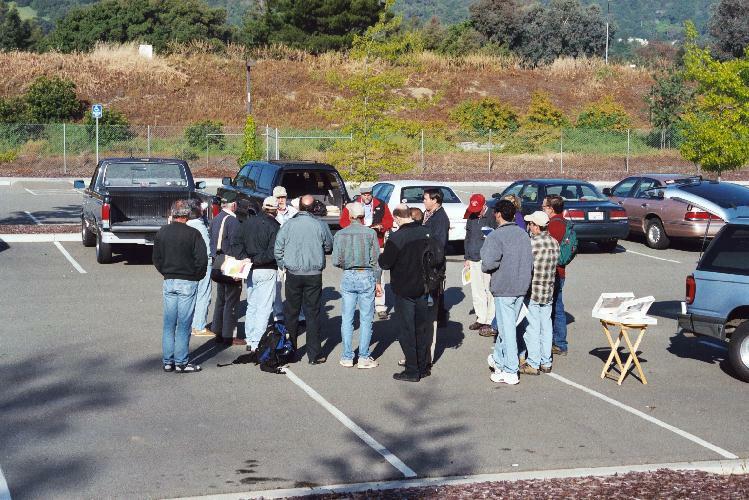 Our day began at 7:30 a.m. at the Danville Park and Drive lot where Ron gave us an overview of the day’s activities. He has subdivided central California geology into five domains each with consistent internal structure and stratigraphy. Ron’s efforts have focused on understanding the structural relationships within and between domains. The domains are Mt. Diablo, East Bay Hills, Calaveras, Idria, and Diablo Range. The focus of this field trip is on the intersection of the Mt. Diablo domain with the Diablo Range domain. The Mt. Diablo domain surrounds the 3849 foot peak of the same name, and is distinct from the Diablo Range domain. The Mt. Diablo domain consists of thrusted and folded rocks in the structure of an antiform. The Altamont Hills (with their wind turbines and the well-known Altamont Pass) are the southeastern extension of the Mt. Diablo antiform. This domain continues to the southeast with a saddle separating the Mt. Diablo antiform from the Black Buttes anticline. The Diablo Range domain lies to the southwest of the Mt. Diablo domain, and it extends southeast to the Idria domain. In April we examined some of the geology of the southern Diablo Range domain on the field trip to Pacheco Pass led by Dr. Gary Ernst. 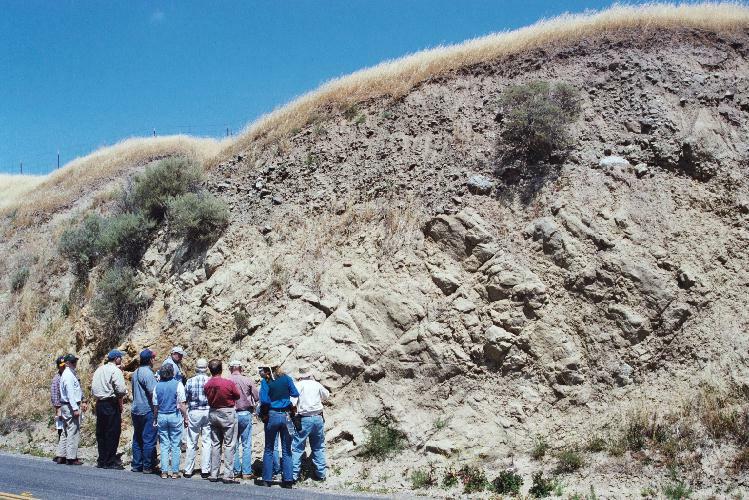 The Diablo Range domain also consists of thrusted and folded rocks in the form of an anticline. The main stratigraphic difference between these two domains is in the Cretaceous section. In the Mt. Diablo domain the bulk of the exposed sediments are Late Cretaceous while in the Diablo Range domain, the bulk of the sediments exposed are Early Cretaceous. The main structural difference is that the Mt. Diablo domain is thrusted to the southwest while the Diablo Range domain is thrusted to the northeast. The San Ramon Valley is being compressed (shortened) by the southwest moving Mt. Diablo domain and the east moving East Bay Hills domain. Uplift and erosion of both the Mt. Diablo antiform and the Diablo Range is continuing today. The highlights of the trip are discussed below. 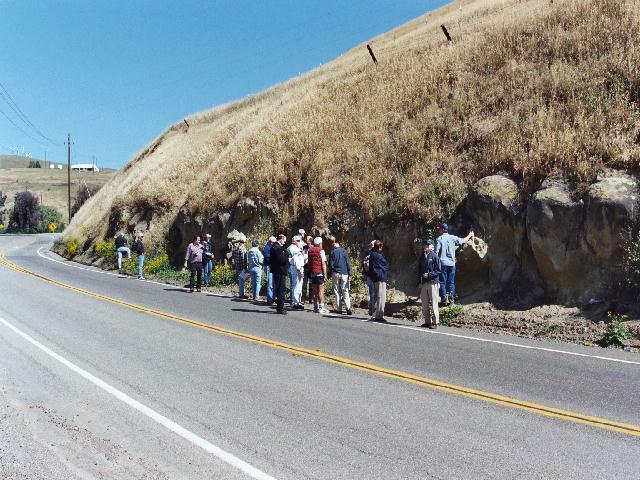 Stop 1: Looking at Cierbo Sandstone in road cut along Old Altamont Pass Road dipping 27 – 30 degrees east. 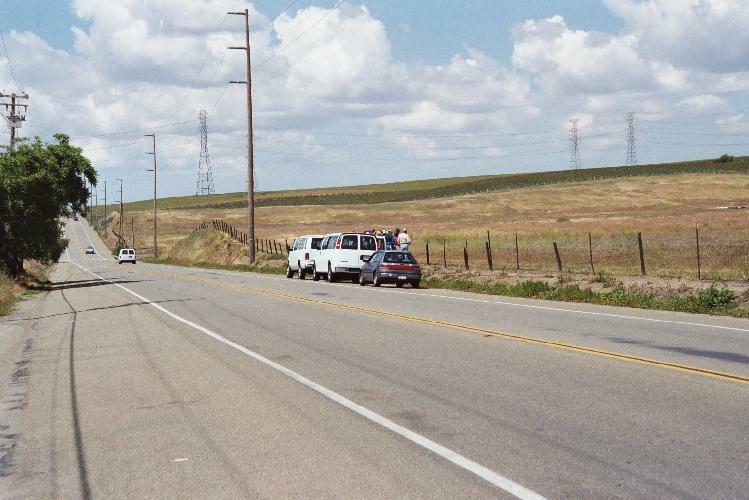 Stop 1 is on Old Altamont Pass Road east of Livermore. Here we are in the Mt. Diablo domain. We are near the west flank of the Mt. Diablo antiform where it is plunging to the southeast. The faults bounding the western portion of this domain include a complex zone of thrust faults called the Greenville fault zone. The relationships here are clearly seen on cross section A-7. The antiform is asymmetric, overturned to the west. 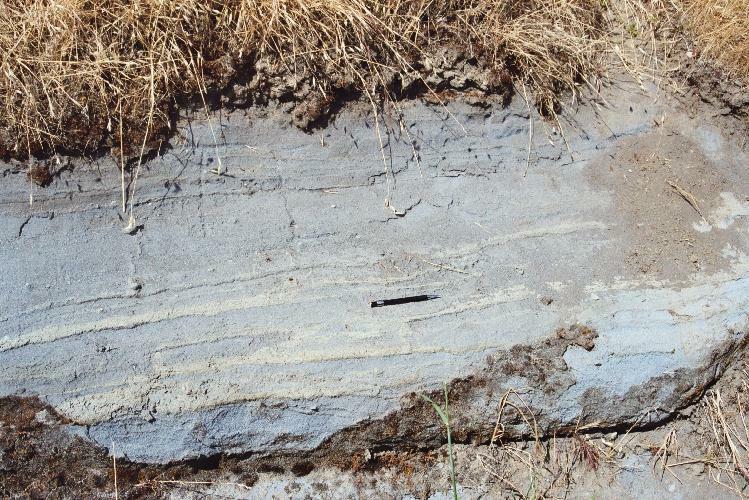 Here we see the structure in the upper Miocene Cierbo sandstone, a shoreline sand lying directly on the Campanian section. Stop 2: Looking at flat lying Campanian Shales and Sands along railway cut. Stop 2 is near the crest of the Mt. Diablo antiform. Here outcrops of flat lying Campanian sands and shales are exposed along the old transcontinental railway route. The geometry can be seen on section A-8. 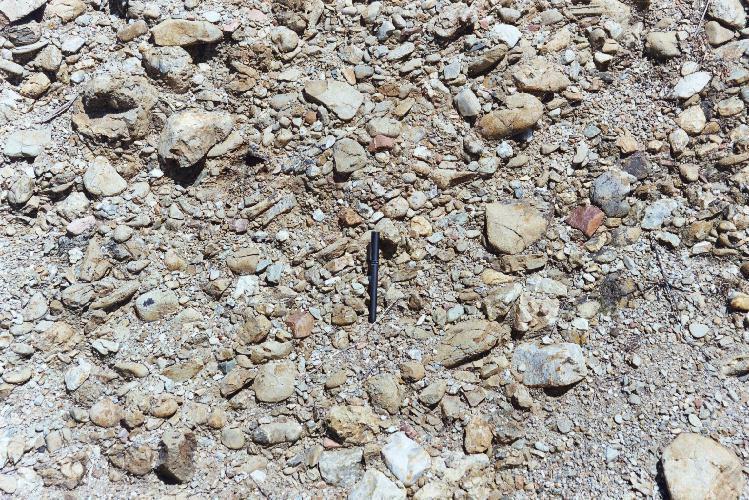 These sands are deep sea fan deposits sourced from the Sierra Nevadas. The outcrops contain many large and small concretions. Stop 3 is on Grant Line Road on the east flank of the Mt. Diablo antiform (section A-12). Here we see the upper Miocene Neroly formation. It is a river (fluvial) deposit containing sands and pebbles with a striking blue coloration. The blue color is due to a montmorillonite-like clay mineral derived from a volcanic ash coating the sand grains. 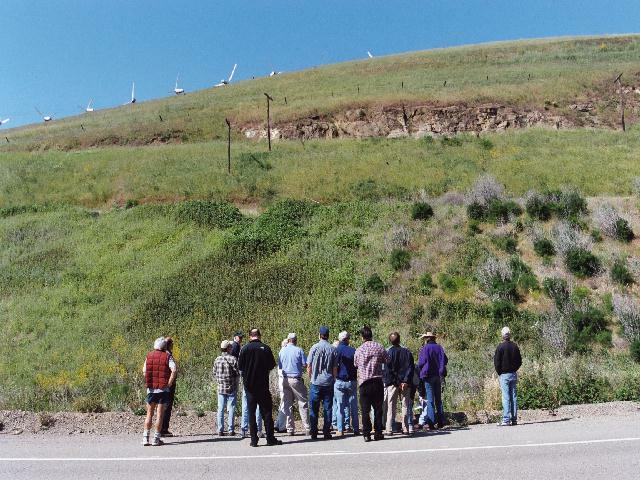 Stop 3: Close up view of the characteristic blue color and lithology of the Neroly Formation near the top of Altamont Pass. Stop 4: Looking at uplifted Pleistocene and Holocene pediments in Corral Hollow. Stops 4 and 5 are along Corral Hollow Road. We are still in the Mt. Diablo domain, but we have crossed a saddle in the structure separating the Mt. Diablo antiform from the Black Buttes anticline. The Campanian is thrust east over the Pleistocene along the Black Buttes fault (sections A-20 and A-21). This uplift is more recent than the Mt. Diablo uplift and must have occurred during the Pleistocene to Recent. Further along the road at Stop 6 we see the shallow dips in the Neroly formation at Castle Rock. Stop 6 Castle Rock in Corral Hollow. Castle Rock is composed of Neroly Formation. After lunch at Carnegie Motorcycle Park we turn onto Tesla Road for a series of stops. Here we are in a complex intersection zone between the Carnegie fault and the Corral Hollow fault. These are major bounding faults marking where the Diablo Range is thrust northward toward the Mt. Diablo domain creating a tightly squeezed trough between them. Stop 7: Looking at near vertical beds of Cierbo Sandstone caught between the Carnegie and Corral Hollow Faults. Note the Pleistocene stream gravel deposit overlying the Cierbo Sandstone. 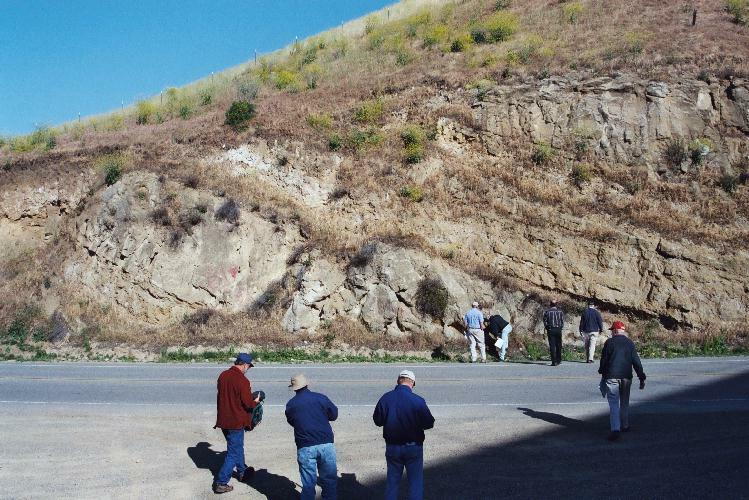 At Stop 7 the Cierbo formation is steeply folded with near vertical beds (section A-17), and at Stop 8 we observe the Neroly from a distance showing nearly 80º dips (section A-16). 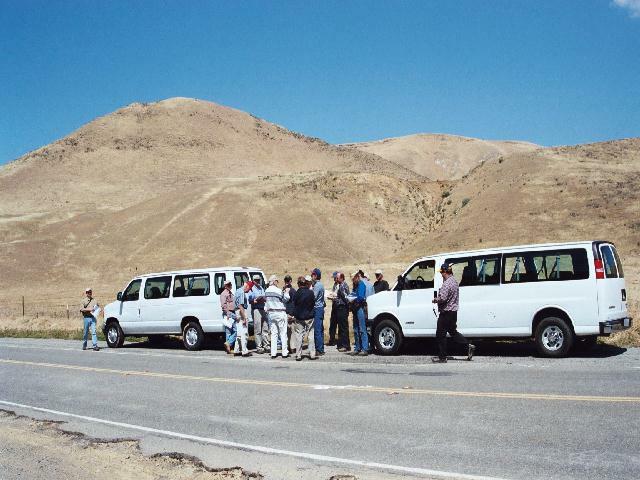 We continue up the road for Stops 9 and 10 to examine outcrops of the Tesla formation (sections A-15 and A-14). Tesla is an Eocene formation equivalent to the Domengine section further to the north, and is composed of sands, coals, dark shales and clays. The Tesla has a high organic content and is the most likely source rock for the oil in the Livermore Oil Field. Oil seeps were first noted in the nineteenth century, and the field was drilled in the early part of the twentieth century. Thin, soft brown coal beds in the Tesla were once mined in a commercial operation. The coal beds have a distinct yellow coating of sulfur on their surfaces. NCGS members collected gypsum rosettes (hydrous calcium sulfate) from the Tesla formation surrounding the coal beds. Stop 11: Looking along the Las Positas Uplift from Greenville Road. 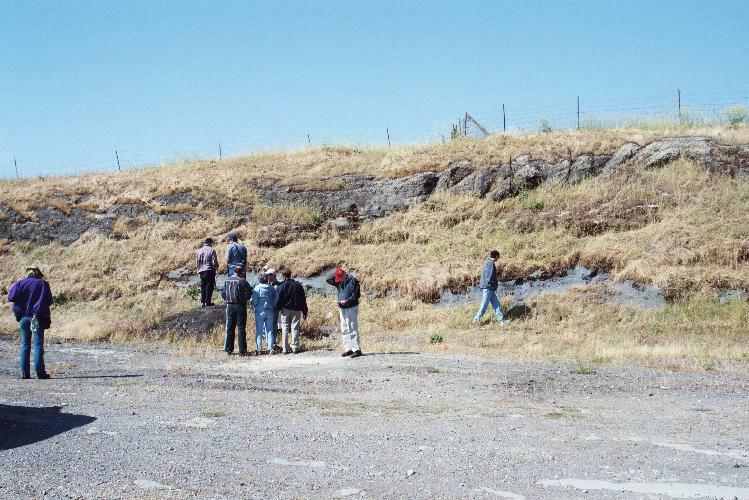 Stop 12: Looking at Holocene gravels (Livermore Gravels ?) exposed in road cut along Greenville Road near crest of Las Positas Uplift. 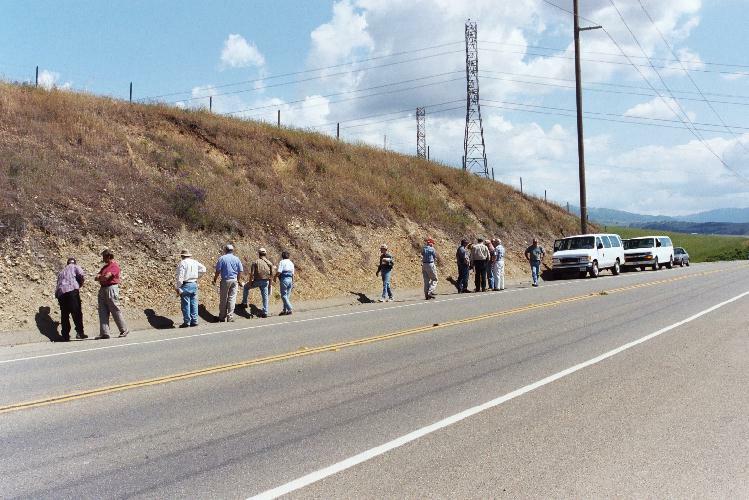 Stops 11 and 12 are on Greenville road for a view of the Las Positas fault uplift (sections A-11 and A-10). 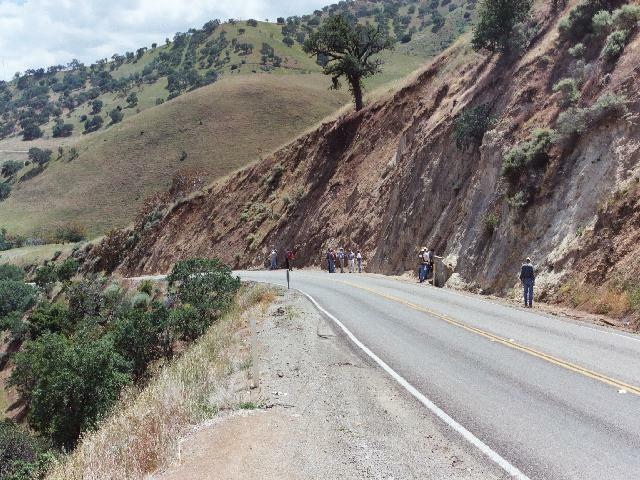 Gravels transported from the Diablo Range were uplifted into an antiform during Holocene time. The NCGS sincerely thanks Ron Crane for leading this excellent field trip. His field guide describes the trip in detail and includes many colored geologic maps and cross sections of the area. We thank Jean Moran for organizing the trip, handling trip registration, and arranging transportation. We thank Tridib Guha and Dan Day for lunch arrangements. These photographs and descriptions have been kindly provided by Patrick Dunn.